Sony confirms in interview that a new “enthusiast” APS-C camera is coming! 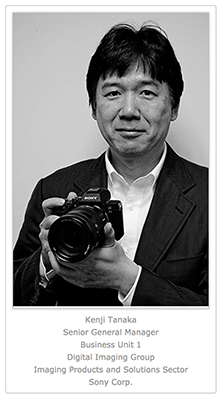 Imaging Resource interviewed Tanaka-san is the Senior General Manager of Business Unit 1 of Sony Imaging Products and Solutions Inc’s Digital Imaging Group. The worldwide ILC market overall was down about 8% on the unit shipment basis last year according to CIPA, but Sony’s Alpha is not following that trend. Based on simple calculation, two years from now, the market will be less than 80% compared to now. But not half. But then, recently there has been a momentum of new cameras. One area is full-frame mirrorless, as you know well. And the full-frame mirrorless’ growth is of course more than 100%. Almost more than 150%. And we implied we are working on the sports area, that implied not only a 400mm f/2.8 lens is coming. So we are implying many things, but not directly saying “next model is this one, the next model is this one”. But we’re focusing on sports and we’re focusing on the APS-C area. The first step is [recognizing] eyes, but of course, we will expand the subject types. Right now I cannot tell you, but we already have a kind of organization, to create a dictionary. We are thinking to study computational photography [applications]. In the smartphone market, I think computational photography is one way to create a new [better] image. That kind of thing, of course we can do too, I mean the ILC (interchangeable-lens cameras can do [too]. So now we are interested in computational photography. If Sony so openly talks about a new A6500 successor than it’s easy to guess such a model will be unveiled soon!